Most AC motors are induction motors. Induction motors are favored due to their ruggedness and simplicity. In fact, 90% of industrial motors are induction motors. Nikola Tesla conceived the basic principals of the polyphase induction motor in 1883, and had a half horsepower (400 watt) model by 1888. Tesla sold the manufacturing rights to George Westinghouse for $65,000. Most large ( > 1 hp or 1 kW) industrial motors are poly-phase induction motors. By poly-phase, we mean that the stator contains multiple distinct windings per motor pole, driven by corresponding time shifted sine waves. In practice, this is two or three phases. Large industrial motors are 3-phase. While we include numerous illustrations of two-phase motors for simplicity, we must emphasize that nearly all poly-phase motors are three-phase. By induction motor, we mean that the stator windings induce a current flow in the rotor conductors, like a transformer, unlike a brushed DC commutator motor. 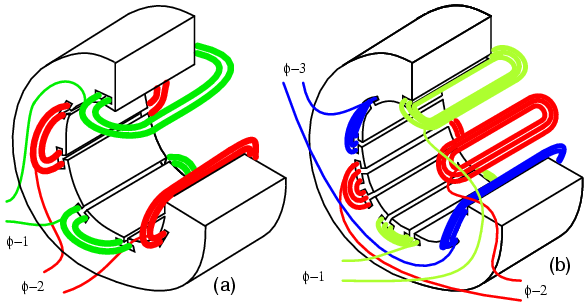 An induction motor is composed of a rotor, known as an armature, and a stator containing windings connected to a poly-phase energy source as shown in Figure below. The simple 2-phase induction motor below is similar to the 1/2 horsepower motor which Nikola Tesla introduced in 1888. The stator in Figure above is wound with pairs of coils corresponding to the phases of electrical energy available. The 2-phase induction motor stator above has 2-pairs of coils, one pair for each of the two phases of AC. 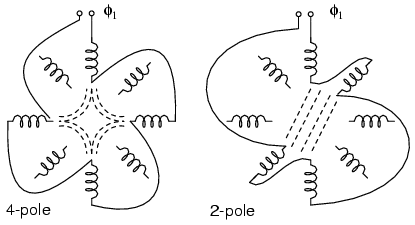 The individual coils of a pair are connected in series and correspond to the opposite poles of an electromagnet. That is, one coil corresponds to a N-pole, the other to a S-pole until the phase of AC changes polarity. The other pair of coils is oriented 90o in space to the first pair. This pair of coils is connected to AC shifted in time by 90o in the case of a 2-phase motor. In Tesla's time, the source of the two phases of AC was a 2-phase alternator. Stator frame showing slots for windings. The stator laminations are thin insulated rings with slots punched from sheets of electrical grade steel. A stack of these is secured by end screws, which may also hold the end housings. Stator with (a) 2-φ and (b) 3-φ windings. In Figure above, the windings for both a two-phase motor and a three-phase motor have been installed in the stator slots. The coils are wound on an external fixture, then worked into the slots. Insulation wedged between the coil periphery and the slot protects against abrasion. Actual stator windings are more complex than the single windings per pole in Figure above. Comparing the 2-φ motor to Tesla's 2-φ motor with salient poles, the number of coils is the same. In actual large motors, a pole winding, is divided into identical coils inserted into many smaller slots than above. This group is called a phase belt. See Figure below. The distributed coils of the phase belt cancel some of the odd harmonics, producing a more sinusoidal magnetic field distribution across the pole. This is shown in the synchronous motor section. The slots at the edge of the pole may have fewer turns than the other slots. Edge slots may contain windings from two phases. That is, the phase belts overlap. 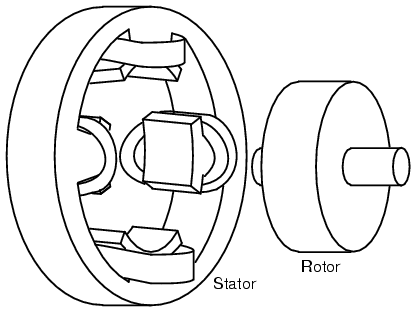 The key to the popularity of the AC induction motor is simplicity as evidenced by the simple rotor (Figure below). The rotor consists of a shaft, a steel laminated rotor, and an embedded copper or aluminum squirrel cage, shown at (b) removed from the rotor. As compared to a DC motor armature, there is no commutator. This eliminates the brushes, arcing, sparking, graphite dust, brush adjustment and replacement, and re-machining of the commutator. 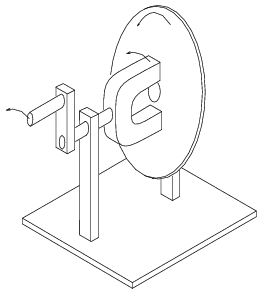 Laminated rotor with (a) embedded squirrel cage, (b) conductive cage removed from rotor. The squirrel cage conductors may be skewed, twisted, with respsect to the shaft. The misalignment with the stator slots reduces torque pulsations. Both rotor and stator cores are composed of a stack of insulated laminations. The laminations are coated with insulating oxide or varnish to minimize eddy current losses. The alloy used in the laminations is selected for low hysteresis losses. A short explanation of operation is that the stator creates a rotating magnetic field which drags the rotor around. The theory of operation of induction motors is based on a rotating magnetic field. One means of creating a rotating magnetic field is to rotate a permanent magnet as shown in Figure below. If the moving magnetic lines of flux cut a conductive disk, it will follow the motion of the magnet. The lines of flux cutting the conductor will induce a voltage, and consequent current flow, in the conductive disk. This current flow creates an electromagnet whose polarity opposes the motion of the permanent magnet– Lenz's Law. The polarity of the electromagnet is such that it pulls against the permanent magnet. The disk follows with a little less speed than the permanent magnet. Rotating magnetic field produces torque in conductive disk. The torque developed by the disk is proportional to the number of flux lines cutting the disk and the rate at which it cuts the disk. If the disk were to spin at the same rate as the permanent magnet, there would be no flux cutting the disk, no induced current flow, no electromagnet field, no torque. Thus, the disk speed will always fall behind that of the rotating permanent magnet, so that lines of flux cut the disk induce a current, create an electromagnetic field in the disk, which follows the permanent magnet. If a load is applied to the disk, slowing it, more torque will be developed as more lines of flux cut the disk. Torque is proportional to slip, the degree to which the disk falls behind the rotating magnet. More slip corresponds to more flux cutting the conductive disk, developing more torque. An analog automotive eddy current speedometer is based on the principle illustrated above. With the disk restrained by a spring, disk and needle deflection is proportional to magnet rotation rate. A rotating magnetic field is created by two coils placed at right angles to each other, driven by currents which are 90o out of phase. This should not be surprising if you are familiar with oscilloscope Lissajous patterns. Out of phase (90o) sine waves produce circular Lissajous pattern. 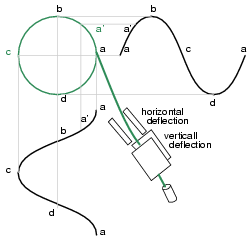 In Figure above, a circular Lissajous is produced by driving the horizontal and vertical oscilloscope inputs with 90o out of phase sine waves. Starting at (a) with maximum “X” and minimum “Y” deflection, the trace moves up and left toward (b). Between (a) and (b) the two waveforms are equal to 0.707 Vpk at 45o. This point (0.707, 0.707) falls on the radius of the circle between (a) and (b) The trace moves to (b) with minimum “X” and maximum “Y” deflection. With maximum negative “X” and minimum “Y” deflection, the trace moves to (c). Then with minimum “X” and maximum negative “Y”, it moves to (d), and on back to (a), completing one cycle. X-axis sine and Y-axis cosine trace circle. Figure above shows the two 90o phase shifted sine waves applied to oscilloscope deflection plates which are at right angles in space. If this were not the case, a one dimensional line would display. The combination of 90o phased sine waves and right angle deflection, results in a two dimensional pattern– a circle. This circle is traced out by a counterclockwise rotating electron beam. For reference, Figure belowshows why in-phase sine waves will not produce a circular pattern. Equal “X” and “Y” deflection moves the illuminated spot from the origin at (a) up to right (1,1) at (b), back down left to origin at (c),down left to (-1.-1) at (d), and back up right to origin. The line is produced by equal deflections along both axes; y=x is a straight line. No circular motion from in-phase waveforms. If a pair of 90o out of phase sine waves produces a circular Lissajous, a similar pair of currents should be able to produce a circular rotating magnetic field. Such is the case for a 2-phase motor. By analogy three windings placed 120o apart in space, and fed with corresponding 120o phased currents will also produce a rotating magnetic field. Rotating magnetic field from 90o phased sinewaves. 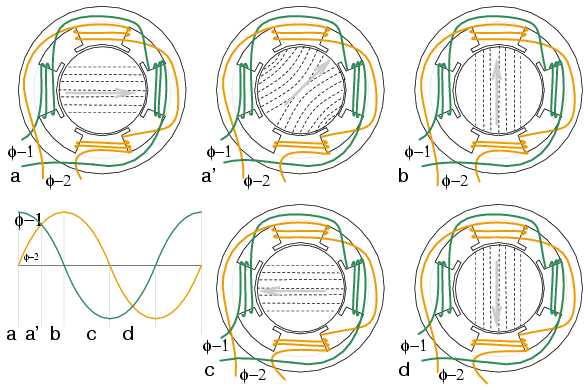 The rotation rate of a stator rotating magnetic field is related to the number of pole pairs per stator phase. The “full speed” Figure below has a total of six poles or three pole-pairs and three phases. However,there is but one pole pair per phase– the number we need. The magnetic field will rotate once per sine wave cycle. In the case of 60 Hz power, the field rotates at 60 times per second or 3600 revolutions per minute (rpm). For 50 Hz power, it rotates at 50 rotations per second, or 3000 rpm. The 3600 and 3000 rpm, are the synchronous speed of the motor. Though the rotor of an induction motor never achieves this speed, it certainly is an upper limit. If we double the number of motor poles, the synchronous speed is cut in half because the magnetic field rotates 180o in space for 360o of electrical sine wave. Doubling the stator poles halves the synchronous speed. The short explanation of the induction motor is that the rotating magnetic field produced by the stator drags the rotor around with it. The longer more correct explanation is that the stator's magnetic field induces an alternating current into the rotor squirrel cage conductors which constitutes a transformer secondary. This induced rotor current in turn creates a magnetic field. The rotating stator magnetic field interacts with this rotor field. The rotor field attempts to align with the rotating stator field. The result is rotation of the squirrel cage rotor. If there were no mechanical motor torque load, no bearing, windage, or other losses, the rotor would rotate at the synchronous speed. However, the slip between the rotor and the synchronous speed stator field develops torque. It is the magnetic flux cutting the rotor conductors as it slips which develops torque. Thus, a loaded motor will slip in proportion to the mechanical load. If the rotor were to run at synchronous speed, there would be no stator flux cutting the rotor, no current induced in the rotor, no torque. Slip at 100% torque is typically 5% or less in induction motors. Thus for f = 50 Hz line frequency, the frequency of the induced current in the rotor fr = 0.05·50 = 2.5 Hz. Why is it so low? The stator magnetic field rotates at 50 Hz. The rotor speed is 5% less. The rotating magnetic field is only cutting the rotor at 2.5 Hz. The 2.5 Hz is the difference between the synchronous speed and the actual rotor speed. If the rotor spins a little faster, at the synchronous speed, no flux will cut the rotor at all, fr = 0. Torque and speed vs %Slip. %Ns=%Synchronous Speed. The Figure above graph shows that starting torque known as locked rotor torque (LRT) is higher than 100% of the full load torque (FLT), the safe continuous torque rating. The locked rotor torque is about 175% of FLT for the example motor graphed above. Starting current known as locked rotor current (LRC) is 500% of full load current (FLC), the safe running current. The current is high because this is analogous to a shorted secondary on a transformer. As the rotor starts to rotate the torque may decrease a bit for certain classes of motors to a value known as the pull up torque. This is the lowest value of torque ever encountered by the starting motor. As the rotor gains 80% of synchronous speed, torque increases from 175% up to 300% of the full load torque. This breakdown torque is due to the larger than normal 20% slip. The current has decreased only slightly at this point, but will decrease rapidly beyond this point. As the rotor accelerates to within a few percent of synchronous speed, both torque and current will decrease substantially. Slip will be only a few percent during normal operation. For a running motor, any portion of the torque curve below 100% rated torque is normal. The motor load determines the operating point on the torque curve. While the motor torque and current may exceed 100% for a few seconds during starting, continuous operation above 100% can damage the motor. Any motor torque load above the breakdown torque will stall the motor. The torque, slip, and current will approach zero for a “no mechanical torque” load condition. This condition is analogous to an open secondary transformer. 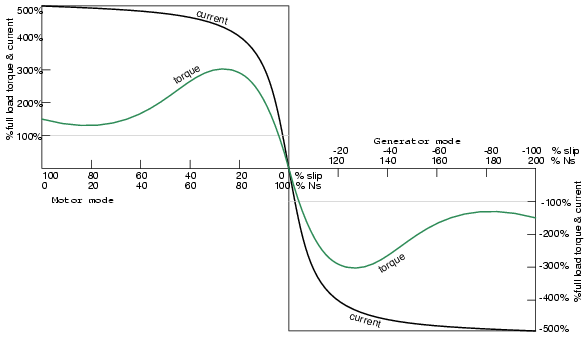 There are several basic induction motor designs (Figure below) showing consideable variation from the torque curve above. The different designs are optimized for starting and running different types of loads. The locked rotor torque (LRT) for various motor designs and sizes ranges from 60% to 350% of full load torque (FLT). Starting current or locked rotor current (LRC) can range from 500% to 1400% of full load current (FLC). This current draw can present a starting problem for large induction motors. 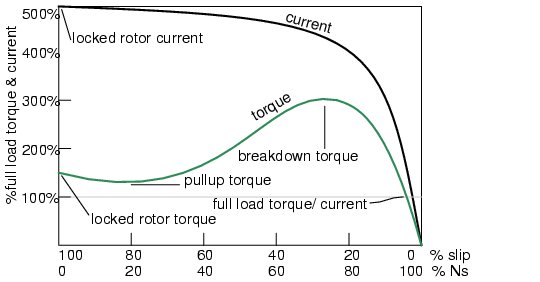 Various standard classes (or designs) for motors, corresponding to the torque curves (Figure below) have been developed to better drive various type loads. The National Electrical Manufacturers Association (NEMA) has specified motor classes A, B, C, and D to meet these drive requirements. Similar International Electrotechnical Commission (IEC) classes N and H correspond to NEMA B and C designs respectively. All motors, except class D, operate at %5 slip or less at full load. Class B (IEC Class N) motors are the default motor to use in most applications. With a starting torque of LRT = 150% to 170% of FLT, it can start most loads, without excessive starting current (LRT). Efficiency and power factor are high. It typically drives pumps, fans, and machine tools. Class A starting torque is the same as class B. Drop out torque and starting current (LRT)are higher. This motor handles transient overloads as encountered in injection molding machines. Class C (IEC Class H) has higher starting torque than class A and B at LRT = 200% of FLT. This motor is applied to hard-starting loads which need to be driven at constant speed like conveyors, crushers, and reciprocating pumps and compressors. Class D motors have the highest starting torque (LRT) coupled with low starting current due to high slip ( 5% to 13% at FLT). The high slip results in lower speed. Speed regulation is poor. However, the motor excels at driving highly variable speed loads like those requiring an energy storage flywheel. Applications include punch presses, shears, and elevators. Class E motors are a higher efficiency version of class B. Class F motors have much lower LRC, LRT, and break down torque than class B. They drive constant easily started loads. Induction motors present a lagging (inductive) power factor to the power line.The power factor in large fully loaded high speed motors can be as favorable as 90% for large high speed motors. At 3/4 full load the largest high speed motor power factor can be 92%. The power factor for small low speed motors can be as low as 50%. At starting, the power factor can be in the range of 10% to 25%, rising as the rotor achieves speed. Power factor (PF) varies considerably with the motor mechanical load (Figure below). An unloaded motor is analogous to a transformer with no resistive load on the secondary. Little resistance is reflected from the secondary (rotor) to the primary (stator). Thus the power line sees a reactive load, as low as 10% PF. As the rotor is loaded an increasing resistive component is reflected from rotor to stator, increasing the power factor. Induction motor power factor and efficiency. Induction motors are typically oversized to guarantee that their mechanical load can be started and driven under all operating conditions. If a polyphase motor is loaded at less than 75% of rated torque where efficiency peaks, efficiency suffers only slightly down to 25% FLT. Frank Nola of NASA proposed a power factor corrector (PFC) as an energy saving device for single phase induction motors in the late 1970's. It is based on the premise that a less than fully loaded induction motor is less efficient and has a lower power factor than a fully loaded motor. Thus, there is energy to be saved in partially loaded motors, 1-φ motors in particular. The energy consumed in maintaining the stator magnetic field is relatively fixed with respect to load changes. While there is nothing to be saved in a fully loaded motor, the voltage to a partially loaded motor may be reduced to decrease the energy required to maintain the magnetic field. This will increase power factor and efficiency. This was a good concept for the notoriously inefficient single phase motors for which it was intended. An induction motor may function as an alternator if it is driven by a torque at greater than 100% of the synchronous speed. (Figure below) This corresponds to a few % of “negative” slip, say -1% slip. This means that as we are rotating the motor faster than the synchronous speed, the rotor is advancing 1% faster than the stator rotating magnetic field. It normally lags by 1% in a motor. Since the rotor is cutting the stator magnetic field in the opposite direction (leading), the rotor induces a voltage into the stator feeding electrical energy back into the power line. Negative torque makes induction motor into generator. Such an induction generator must be excited by a “live” source of 50 or 60 Hz power. No power can be generated in the event of a power company power failure. This type of alternator appears to be unsuited as a standby power source. As an auxiliary power wind turbine generator, it has the advantage of not requiring an automatic power failure disconnect switch to protect repair crews. It is fail-safe. Small remote (from the power grid) installations may be make self-exciting by placing capacitors in parallel with the stator phases. If the load is removed residual magnetism may generate a small amount of current flow. This current is allowed to flow by the capacitors without dissipating power. As the generator is brought up to full speed, the current flow increases to supply a magnetizing current to the stator. The load may be applied at this point. Voltage regulation is poor. An induction motor may be converted to a self-excited generator by the addition of capacitors. Start up procedure is to bring the wind turbine up to speed in motor mode by application of normal power line voltage to the stator. Any wind induced turbine speed in excess of synchronous speed will develop negative torque, feeding power back into the power line, reversing the normal direction of the electric kilowatt-hour meter. Whereas an induction motor presents a lagging power factor to the power line, an induction alternator presents a leading power factor. Induction generators are not widely used in conventional power plants. The speed of the steam turbine drive is steady and controllable as required by synchronous alternators. Synchronous alternators are also more efficient. The speed of a wind turbine is difficult to control, and subject to wind speed variation by gusts. An induction alternator is better able to cope with these variations due to the inherent slip. This stresses the gear train and mechanical components less than a synchronous genertor. However, this allowable speed variation only amounts to about 1%. Thus, a direct line connected induction generator is considered to be fixed-speed in a wind turbine. See Doubly-fed induction generator for a true variable speed alternator. Multiple generators or multiple windings on a common shaft may be switched to provide a high and low speed to accomodate variable wind conditions. Some induction motors can draw over 1000% of full load current during starting; though, a few hundred percent is more common. Small motors of a few kilowatts or smaller can be started by direct connection to the power line. Starting larger motors can cause line voltage sag, affecting other loads. Motor-start rated circuit breakers (analogous to slow blow fuses) should replace standard circuit breakers for starting motors of a few kilowatts. This breaker accepts high over-current for the duration of starting. Motors over 50 kW use motor starters to reduce line current from several hundred to a few hundred percent of full load current. An intermittent duty autotarnsformer may reduce the stator voltage for a fraction of a minute during the start interval, followed by application of full line voltage as in Figure above. Closure of the S contacts applies reduced voltage during the start interval. The S contacts open and the R contacts close after starting. This reduces starting current to, say, 200% of full load current. Since the autotransformer is only used for the short start interval, it may be sized considerably smaller than a continuous duty unit. Three-phase motors will run on single phase as readily as single phase motors. The only problem for either motor is starting. Sometimes 3-phase motors are purchased for use on single phase if three-phase power is anticipated. The power rating needs to be 50% larger than for a comparable single phase motor to make up for one unused winding. 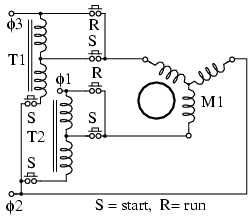 Single phase is applied to a pair of windings simultanous with a start capacitor in series with the third winding. The start switch is opened in Figure below upon motor start. Sometimes a smaller capacitor than the start capacitor is retained while running. Starting a three-phase motor on single phase. The circuit for running a three-phase motor on single phase is known as “add a phase” or various other brand names. “Add a phase” supplies a phase approximately midway ∠90o between the ∠180o single phase power source terminals. Induction motors may contain multiple field windings, for example a 4-pole and an 8-pole winding corresponding to 1800 and 900 rpm synchronous speeds. Energizing one field or the other is less complex than rewiring the stator coils in Figure below. Multiple fields allow speed change. If the field is segmented with leads brought out, it may be rewired (or switched) from 4-pole to 2-pole as shown above for a 2-phase motor. The 22.5o segments are switchable to 45o segments. Only the wiring for one phase is shown above for clarity. Thus, our induction motor may run at multiple speeds. When switching the above 60 Hz motor from 4 poles to 2 poles the synchronous speed increases from 1800 rpm to 3600 rpm. If the motor is driven by 50 Hz, what would be the corresponding 4-pole and 2-pole synchronous speeds? Variable voltage controls induction motor speed. Modern solid state electronics increase the options for speed control. By changing the 50 or 60 Hz line frequency to higher or lower values, the synchronous speed of the motor may be changed. However, decreasing the frequency of the current fed to the motor also decreases reactance XL which increases the stator current. This may cause the stator magnetic circuit to saturate with disastrous results. In practice, the voltage to the motor needs to be decreased when frequency is decreased. Conversely, the drive frequency may be increased to increase the synchronous speed of the motor. However, the voltage needs to be increased to overcome increasing reactance to keep current up to a normal value and maintain torque. The inverter (Figure ) approximates sinewaves to the motor with pulse width modulation outputs. This is a chopped waveform which is either on or off, high or low, the percentage of “on” time corresponds to the instantaneous sine wave voltage. Scaler Control Low cost method described above to control only voltage and frequency, without feedback. Vector Control Also known as vector phase control. The flux and torque producing components of stator current are measured or estimated on a real-time basis to enhance the motor torque-speed curve. This is computation intensive. Direct Torque Control An elaborate adaptive motor model allows more direct control of flux and torque without feedback. This method quickly responds to load changes. A polyphase induction motor consists of a polyphase winding embedded in a laminated stator and a conductive squirrel cage embedded in a laminated rotor. 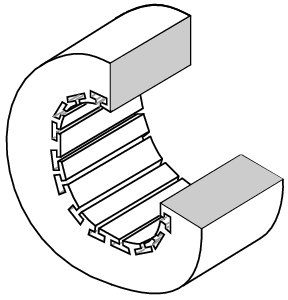 Three phase currents flowing within the stator create a rotating magnetic field which induces a current, and consequent magnetic field in the rotor. Rotor torque is developed as the rotor slips a little behind the rotating stator field. Motor starters minimize loading of the power line while providing a larger starting torque than required during running. Starters are only required for large motors. Multiple field windings can be rewired for multiple discrete motor speeds by changing the number of poles. The wound stator and the squirrel cage rotor of an induction motor may be cut at the circumference and unrolled into a linear induction motor. The direction of linear travel is controlled by the sequence of the drive to the stator phases.